Bosch is the worlds leading manufacturer of automotive systems and components, renowned for technical design and innovation, together with industry leading product efficiency and ultimate reliability. As a result, They are original equipment suppliers to most of the worlds leading vehicle manufacturers who specify and rely on Bosch Bulbs. Bosch's Power White bulbs are favoured by rally enthusiasts because of their brilliant white light, this gives a major advantage should any dangerous situations arise as well as making the car stand out from the crowd. These Bosch Bullbs are fuelled by advanced design and backed by the prestigious Bosch brand with its longstanding commitment to xenon bulb innovation. Bosch Power White Bulbs provide drivers with an unparalleled level of illumination and meets all FMVSS 108 and CMVSS 108 requirements. Best of all, these bulbs are road legal and can easily be interchanged with existing headlight bulbs. Rally Light - These Bosch Bulbs are favored by rally enthusiasts bacause of their brilliant light. 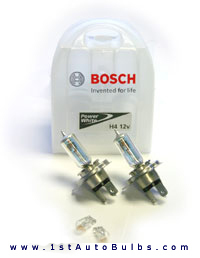 Brightest Light - These Bosch Bulbs shine with a luminance greater than most other xenon performance bulbs. Sharpest Light - The profile of these Bosch Bulbs, there silver tip, and amethyst blue coating create a dramatic, high-end, crisp, clean look. Matching Light - All Bosch Bulbs come with FREE Bosch matching Sidelight bulbs. Bosch's Performance Plus bulbs illuminate with a searing intensity, bacause the emit up to 50% more light than standard bulbs they are comparable with far more expensive Xenon bulbs and HID bulbs (High Intensity Discharge). These Bosch bulbs are fueled by advanced design and backed by the prestigious Bosch brand with its longstanding commitment to xenon bulb innovation. Bosch Bulbs provide drivers with an unparalleled level of illumination and meets all FMVSS 108 and CMVSS 108 requirements. Best of all, these Bosch bulbs are road legal and can easily be interchanged with existing headlight bulbs. Absolutely the Whitest Light Available - The colour of these Bosch Bulbs is comparable to Xenon bulbs and High Intensity Discharge (HID) headlights. Sharpest Light - The profile of these Bosch Bulbs, its silver tip, and amethyst blue coating create a dramatic, high-end, crisp, clean look. 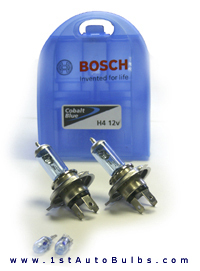 Bosch Cobalt Blue headlight upgrade bulbs offer the distinct xenon HID light look with a subtle hint of blue. The Bosch Cobalt Blue headlight bulb replicates the xenon HID High Intensity Gas Discharge System fitted as standard to more and more of today's prestige and performance cars. The new and improved design of these Bosch Bulbs means the Cobalt Blue bulb burns at 4000 Kelvin which provides a light much closer to natural daylight. The lamps recreate daylight driving conditions at night therefore contributing to safety and performance. These Bosch bulbs are also EC37 approved for use in Europe and are completely interchangeable with existing lamps. 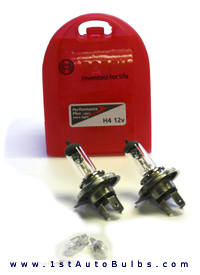 Most car headlamp bulb sizes are available including: H1, H3, H4, H7, 9005 HB3, and 9006 HB4 fitments. Cobalt Blue headlight bulbs are also ideal for Motorbikes giving a distinctive look on the road, Improving visibility.